Nevada Barr on tour for The Rope. Nevada Barr, Track of the Cat. Nevada Barr reads from Borderline. Chicago Public Library discusses High Country. Join Sarah for discussions of literary books by & about lesbians. Meetings are the 1st Sunday of every month at 2 pm. 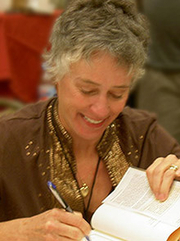 Nevada Barr is a mystery fiction author, known for her "Anna Pigeon" series of mysteries, set in National Parks in the United States. She grew up in Johnsonville, California. In 1984 she published her first novel, Bittersweet, a bleak lesbian historical novel set in the days of the Western frontier. Nevada Barr's book New Orleans Noir: The Classics was available from LibraryThing Early Reviewers. Nevada Barr's book Destroyer Angel was available from LibraryThing Early Reviewers. Nevada Barr is currently considered a "single author." If one or more works are by a distinct, homonymous authors, go ahead and split the author. Nevada Barr is composed of 6 names. You can examine and separate out names.